Contact us for an inspection of your lift to see how we can help you prolong its life. We are a local contractor company providing boat lift repair services including annual inspections, adjustments, and preventative maintenance. The goal of Coastal Boat Lift Repair, LLC is to do a professional job at a fair price in a timely manner. When you contact Doug Banks, he is on time, every time. Boat lifts in our area are exposed to harsh environmental factors including sun, saltwater, wave action, and just plain wear and tear. 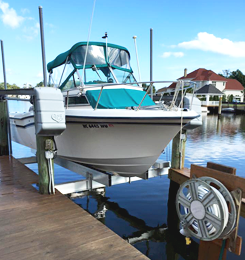 We perform annual maintenance services to extend the life of your boat lift. Our contract service will minimize costly service calls, repairs, and most importantly, lost time out on the water.